Udim (Hebrew: אוּדִים, lit. Firebrands) is a moshav in central Israel. 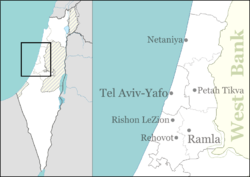 Located near Netanya, it falls under the jurisdiction of Hof HaSharon Regional Council. In 2017 it had a population of 1,367. And the LORD said unto Satan: 'The LORD rebuke thee, O Satan, yea, the LORD that hath chosen Jerusalem rebuke thee; is not this man a brand plucked out of the fire? South-east of the moshav is a nature reserve, first declared in 1967, and expanded in 1997, 140 dunams in total. The reserve is in an old quarry, where the water table has risen, allowing a concentration of aquatic plants to flourish. Flora includes Salix acmophylla and Tamarix trees, Rubus sanguineus, Reeds, and Cattails. ^ "List of National Parks and Nature Reserves" (PDF) (in Hebrew). Israel Nature and Parks Authority. Archived from the original (PDF) on 2009-10-07. Retrieved 2010-09-27. ^ "Udim Nature Reserve". iNature.info (in Hebrew). Retrieved 2010-10-13. This page was last edited on 14 July 2018, at 12:30 (UTC).